This authentic Hungarian one-course vegetable dish has already been the part of the Hungarian cuisine. No wonder, since it is not only imaginative, delicious, simple, but also almost everybody likes it. You can make this delicacy in several ways. This is only one version. First boil the eggs, meanwhile peel the potatoes and clean the onions. When the eggs are ready, slice them together with the other ingredients, then in a buttered tray make layers in the following way (from down to top): potato, onion, egg, sausage. Put the layers onto each other until the tray is full. Keep in mind that you shouldn't heap up, but leave a 1 cm wide part empty between the edge of the tray and the top surface. 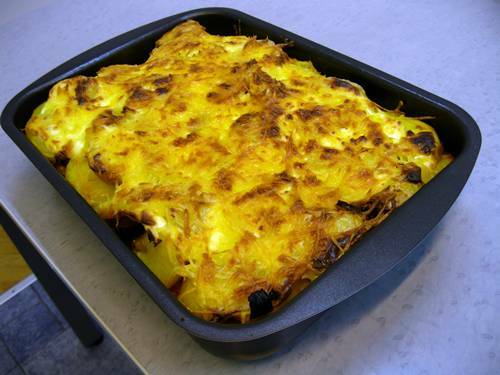 Put it into the oven, then roast it at a moderate temperature while the potato becomes soft. After that put it out and smear sour cream to taste onto the top and cover it totally, and then grate cheese onto it. In the end put the dish back into the oven to melt it, and roast the cheese onto it. Pre-cook the potato a bit. This makes it easier to slice it nicely, in addition, the dish will get ready more quickly. If we do not like to use boiled eggs, we can also crack and beat them, stir in some salt, pepper and some chopped parsley, then spread the beaten egg mix onto every potato layer. This method makes the dish exceedingly juicy and delicious. You can use bacon instead of sausage, which roasts crunchy, increasing the culinary pleasures. You should put the sausage onto the top of every layer so that the roasted fat could leak through the underlying vegetable layers, making the dish even more delicious. You can further improve the recipe by adding new vegetables.